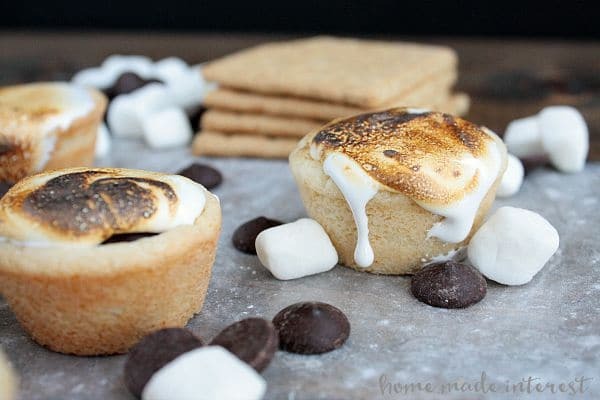 S'mores Cups - Home. Made. Interest. 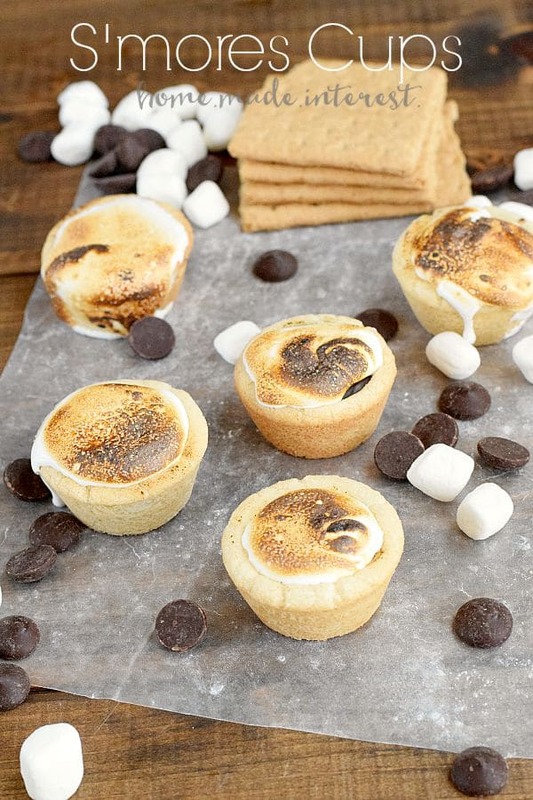 These S’mores Cups are simple, sweet, bites of chocolate ganache and toasted marshmallow, in a sugar cookie crust. S’mores are one of my favorite dessert. I’m not gonna turn down a piece of pie or a brownie but if there is something that says s’mores on the menu I have to try it. Chocolate, toasted marshmallows and graham crackers all smooshed together, yum! I love the graham cracker part of the s’mores but these days you see people sandwiching the toasted marshmallow and chocolate between all sorts of things. I think the most drool-worthy one I saw on Pinterest the other day was a big marshmallow and oozing melted chocolate sandwiched between two chocolate chip cookies. Move over graham crackers you have some competition! Note: This post contains affiliate links. This means if you click on a link and purchase something we may be compensated. August 10th is National S’mores Day, and since I am such a fan I can’t let the day slip by without properly celebrating my love of all things s’mores. 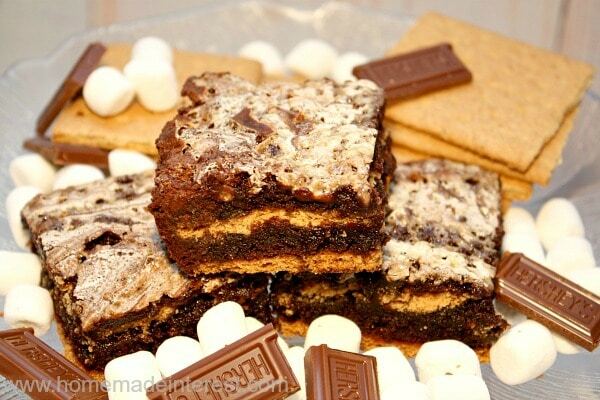 Last year we made these delicious s’mores brownies to celebrate S’mores Day. They were perfectly ooey gooey, with the graham crackers baked right into the brownies and marshmallow fluff swirled into the brownie mix. I wasn’t sure we could do better this year. Then we made these. I think I may have died and went to heaven! These little bites of chocolately, marshmallow-y, goodness are the perfect way to celebrate S’mores day. We stepped up our game using mini sugar cookie cups, like the ones we made for our Lime Cheesecake Cups, and Chocolate Peanut Butter Cookie Cups, and filling them with dark chocolate ganache. To get the perfect cup shape use a pastry tamper. For me the choice to use dark chocolate rather than milk chocolate raised them to the next level. They are the grown-up version of the dessert we’ve all loved since we were kids. We cut large marshmallows in half and put one half on top of each cookie cup, covering the ganache. Then we used a brulee torch to toast the marshmallow. I think that might have been our favorite part. Forget campfires I’m using a torch for all of my marshmallow toasting needs from now on! 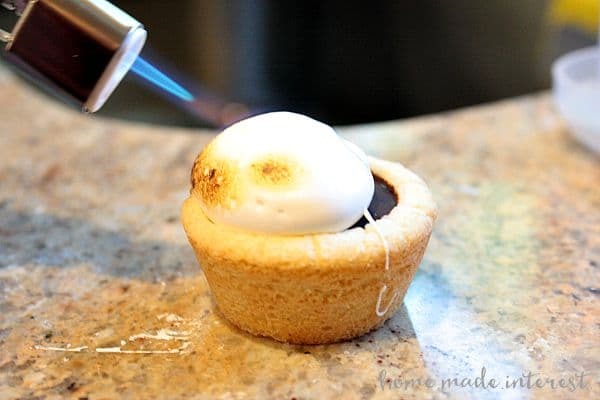 Sugar cookie cups filled with dark chocolate ganache and topped with a toasted marshmallow. Microwave heavy cream 1 minute or until it begins to boil. Pour hot cream onto chocolate and stir until chocolate is completely melted and smooth. Add ganache to each cookie cup and top with one half of a marshmallow. If you love s’mores as much as I do make sure you check out our S’mores Pretzel Bites recipe too! Oh. My. Goodness. These look so cute! 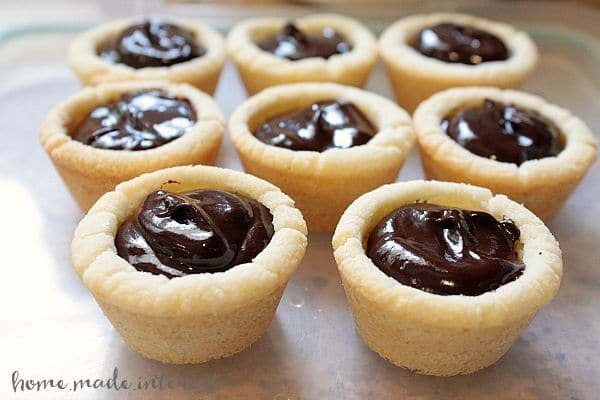 I’m going to have to try those cookie cups, they look really delicious and super versatile! LOL, we are kind of addicted to cookie cups now. Every time we think dessert we think of them. They never get old (to us)! oh my goodness!!! i need these now!!! been addicted to smores this summer, so need to make these!! pinning & sharing!! Saw your post on the Weekend Re-Treat and had to stop by. Looks delicious!! I found you on the LInk party Palooza! I love smores, so this stuck with me! Can’t wait to make them! 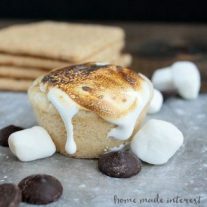 Ummmm I am just a little bit in love with s’mores cups right now! I found you on Bewitchin Projects Block Party. Yum! I agree dark chocolate totally makes this a grown up dessert. Looks so good. Oh my! This looks positively delicious and bad for me! ha.. my kids thank you, my dress size doesn’t. Great post and idea! This is my kind of desert! I love all things smores too. This is such an awesome Idea! I love all these different s’mores recipes that I’ve been coming across! This will have to go on my must make list! I would love if you stopped by and linked up at tonights Throw Back Thursday party! 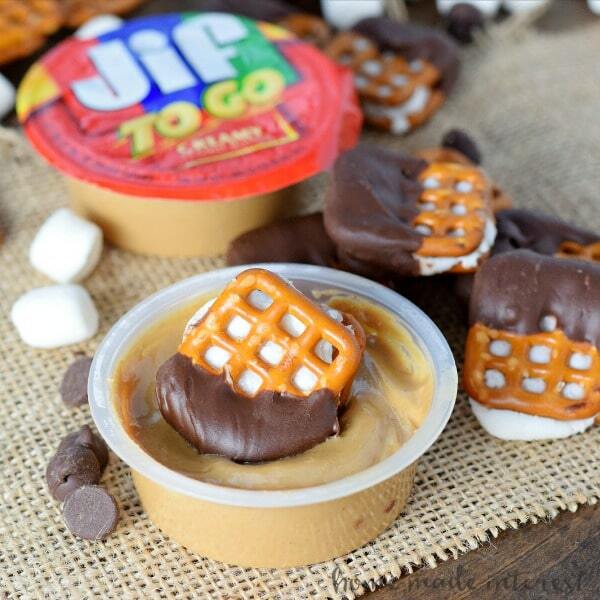 Little smore’s bites…could it get any more delicious? Now these are not going to help when trying to be good! Think I could eat smores in any form! These cute cups look awesome.